Synopsis: Lara Jean keeps her love letters in a hatbox her mother gave her. One for every boy she's ever loved. When she writes, she can pour out her heart and soul and say all the things she would never say in real life, because her letters are for her eyes only.Until the day her secret letters are mailed, and suddenly Lara Jean's love life goes from imaginary to out of control. The title may be catchy but as is so often the case, it’s not quite representative of what’s between the front and back covers. Whilst boyfriends past, present and future do play a large role in Lara Jean’s life, I’m not convinced they’re the real crunch point of the story. Lara Jean’s been in love several times. 5 times, in fact. When her feelings evaporate, she writes a letter to the boy in question – not to be delivered, but for herself. A little memorandum of what was once. They live inside the teal hat box her mum gave her, unopened and unread. Until her dad accidentally takes the box and its contents to the local charity shop. The letters get delivered and Lara Jean’s scabs are torn open again as each boy realises that he, too, was once her secret affection. 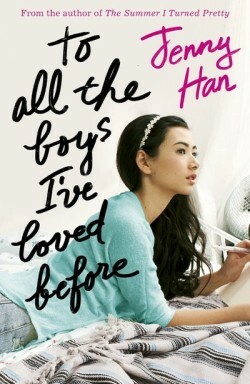 Whilst the boys and the letters are a catalyst for the story, they’re not what To All the Boys I’ve Loved Before is about, at its core. Its grander narrative is that of sisters: Lara Jean, the middle one, her older sister Margot and younger Kitty (who is as cute as the “IT’S SO FLUFFY I’M GONNA DIE” girl from Despicable me). As their dad is widowed, Margot takes up responsibility for the household – she’s devilishly organised – but soon she’ll be gone, half way across the globe at university in Scotland. It’s up to Lara Jean to take her place. Except, of course, she doesn’t take her place. She makes it her own. There are two things I took from To All the Boys I’ve Loved Before ­- the loving yet conflicting relationships of siblings and the acceptance of change. Forget the romance, the boys, the letters – it’s with Lara Jean’s family dynamics that Han really strikes gold and delivers a beautiful story about what it means to be sisters. A touching tale about growing up and taking charge, To All the Boys I’ve Loved Before deserves to be read by mothers, fathers, sisters, brothers, daughters, sons, uncles, aunts, nephews and nieces. Anyone who’s ever felt like a part of a family – and hopefully, that’s everyone.